Since 2002, Ironman Wisconsin has been held in the welcoming college town of Madison Wisconsin on the second Sunday in September. Each year, more than 2,000 athletes converge on Madison to participate in this Ironman, which features a 2.4 mile swim in Lake Monona, a 112 mile bike ride through Wisconsin farmland, capped by a 26.2 mile marathon run through the University of Wisconsin campus to a finish line at the state capital building steps. It's a tougher race than meets the eye. Weather conditions can fluctuate wildly. A seemingly tame bike course, based on comparing elevation changes with Ironman races in Lake Placid and Canada, can actually be as challenging. And if the heat reaches 90 degrees or more, as it has in the past, the marathon becomes a race of attrition. I've completed the event five times, and observed it as a spectator once. 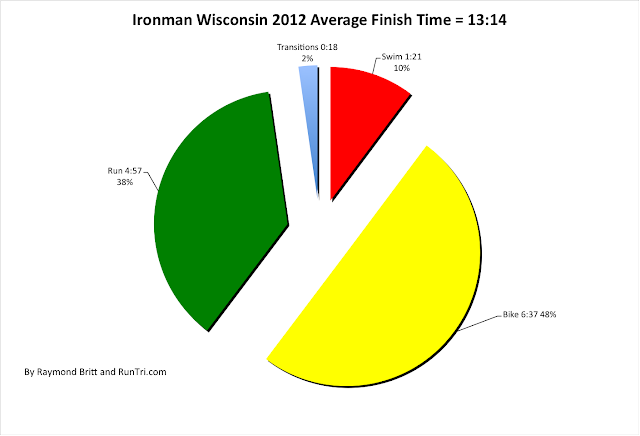 So, having seen it from both sides, I can tell you just about everything you need to know to finish Ironman Wisconsin. Registration tends to go smoothly in the Monona Terrace building, which serves as Race Central and the transition and bike rack areas on race day. Take a tour of the building; it's one of Frank Lloyd Wright's modern designs, with a terrific view of Lake Monona. 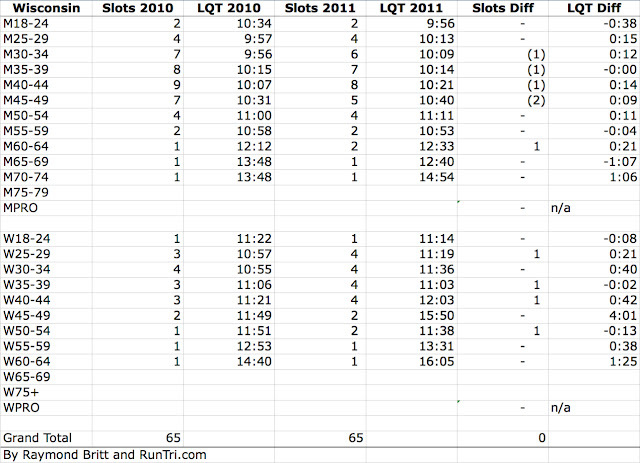 You can swim in Lake Monona in the days before the race, per the race schedule. Drive the bike course, of course, to check out the terrain. You will not be intimidated, as the elevation changes are slight. Don't be fooled. The run course is not easily inspected before race day. It's on roads, closed streets, through a stadium and on a bike path. See what you can, and don't worry about it. It's not a terrifying run course. You'll see it on race day. Bike and transition check-in occur on Saturday. You will rack your bike in perhaps the longest bike area you've seen in a triathlon, completely across the top Monona Terrace parking deck. You will place your bike and run transition bags in numerical order rows in two respective transition rooms inside Monona Terrace. 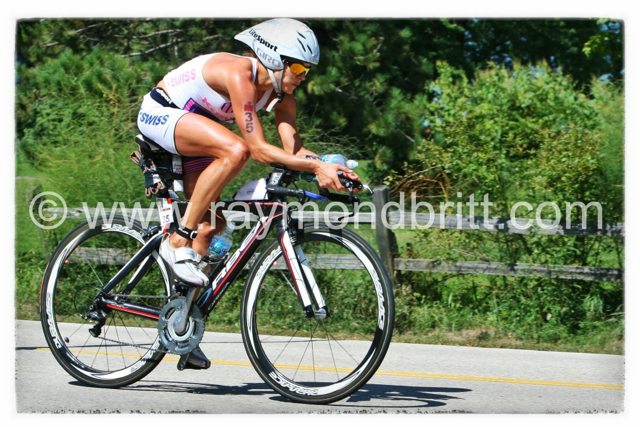 Make a mental note of generally where the bags and your bike are; on race day it will be pretty easy to find them. Make sure you put a tire/tube, CO2 and appropriate bike tools on your bike. I saw too many people with flats or other problems, standing on the side of the Ironman Lake Placid course last month, waiting for the bike crew to come fix their bike. Sorry, it's not supposed to work that way; they're there for extreme situations. Be responsible; carry what you might need. Overnight and race day conditions can vary widely, and past races have seen 39 degrees at 7am, cold pouring rain all day, or scorching heat. Consider having extra clothing in your transition bags: arm warmers and a vest in your bike bag for cold conditions. Put plastic bags over your bike seat and handlebars, to protect from overnight dampness or rain. Then, eat well and get a good night's sleep. 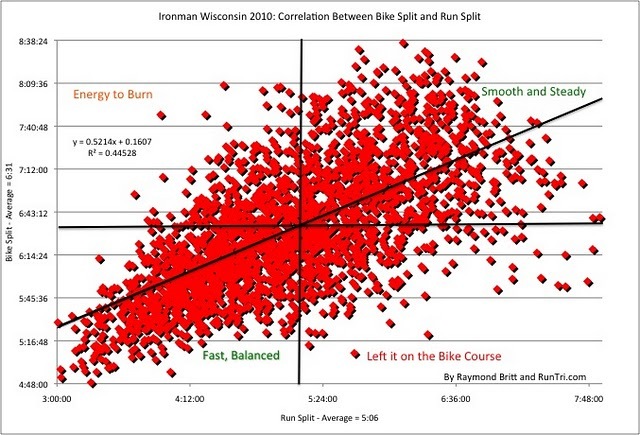 The pre-race process is simple and smooth at Ironman Wisconsin. Body marking takes place on the northern, top deck of Monona Terrace. There tend to be more than enough people doing body marking, so the wait won't be too long. After that, you are free to visit your bike to add nutrition, etc., and you can check your transition bags. Assuming everything is in order, venture inside the Monona Terrace building and find a spot on the floor for last minute relaxation and preparation. Make sure you leave the transition area by about 6:20pm, and begin approaching the swim start area. Normally I would not counsel a departure this early, but the swim start entry area is quite small, and it always takes a long time to get more than 2000 swimmers through a narrow water’s entrance (over the timing mats). Complicating things a little is that there’s almost no shallow area for swimmers to adjust to the water before swimming ahead. You have to go right in. But the athletes tend to pause before entering, dipping a toe in the water, so to speak, and everything backs up. Trust me, you need to allow extra time to enter the water. Once in the water, unfortunately, you will have to tread water until the 7am start. Unlike the swim venues in Lake Placid or Canada, for instance, there is no beach on which to rest a little. You will be out in open water, using up a little energy. Try to relax and float on your back; it’s not a bad way to pass the time before an Ironman race, appreciating the sky. The Ironman Wisconsin swim is a two-loop, 2.4 mile swim in Lake Monona. The water tends to be flat, but I have noticed a small current that seems to be there every year. Nothing that will affect your swim start. The starting line is quite wide, maybe 200 meters or so, split by a water-skiing jumping ramp. The ramp is a decent starting guide; if you want to start wide of the pack, stay to the right of the ramp. If you desire some physical contact in an attempt to go with the fast folks, be my guest: line up to the left. I usually stay to the right. The mass start is still not without the usual Ironman swim commotion and messiness. The course heads south, with the rising sun in your eyes and the splashing of eager triathletes around you. Visibility will be compromised in the beginning, as it usually is. Just stay with the swimmers around you, and the first few hundred meters will speed by relatively quickly. You’ll then make one left at the first large orange cone, swim a couple hundred more meters, and take another left, to begin your northbound return to the starting area. This time, you’ll be able to sight very easily, with the shore, the downtown Madison skyline and Monona Terrace in clear view. However, it’s on this northbound section that I have felt the tugging of slight currents in the past. Actually, I don’t feel it, but it pulls me inside the buoys lining the route. I get too busy watching Monona Terrace pass that I fail to recognize that I’m being pulled off course to the left. After correcting a couple of times, I get better. But pay attention to the possibility; it creeps up on me each time. Things will thin out somewhat on the second lap, and it’s up to you to keep a steady pace, while also reserving most of your energy for the rest of the race day. Making the final turn on lap 2, you will spot the exit area, and be glad you’re almost there. But even after you swim pass the starting line, you will still have a short distance to go. Be patient, you’ll get there. Once out of the water, you’ll steal an anxious glance at the clock. Were you fast or slow? My advice: don’t let the time on the clock elate or depress you too much. Times in the Lake Monona water have varied for me, and usually are a bad predictor of the kind of day ahead. Sometimes, the course is slow, sometimes it’s fast. It is what it is, just head towards your bike. Steps after you’re ashore, you’ll be greeted by delightfully cheerful volunteers who are eager to remove your wetsuit for you. It’s not mandatory, but can be fun, especially for first timers. Flop on your back, and they rip it off; hop up and run toward transition. Or run through all the fuss and remove your wetsuit in the changing area. I usually do the latter. Getting to the transition changing area is most unique. It involves running from the first to the third floors of the parking structure on its circular ramp, referred to as ‘the helix’. Spectators line the path, and you can run or walk up the helix. It takes time, but also allows your head to clear a little after the swim. Run into the building, grab your swim-to-bike transition bag in one room, and keep moving to the changing area. Since about one person per second enters this area during peak time, there probably will be no chairs to sit on. Just find yourself a spot on the carpet, and change there. Helmet, bike shoes, gloves, bib number, sunglasses, and off you go, out the door to find your bike. You will have to run some distance, to the far north of the parking deck to enter the bike area, then the complete length of the deck to the south exit area, while pausing to get your bike along the way. You will not set speed records during this transition. It will take several minutes for you and for everybody. Don’t panic, don’t rush, just move smoothly. You’ll do fine. Then down the south side helix, and you’re onto the bike course. The 112 mile Ironman Wisconsin bike course starts fun and fast, then gradually eats away at you over the miles. It throws no serious difficulty your way, but it refuses to yield over most of the course. Go out too fast, and you can suffer later. With that as a sort of warning, the first 16 or so miles, out to the two-loop section, are a good warm-up, taking riders to the west of Madison, from the small city toward classic Midwestern farmland. Some small rollers stretch your leg muscles, and a couple of pretty steep but short downhills will give you a speed boost, but also provide warning that they may hurt you a little on the way back. Reaching the 39-mile loop section, you’ll continue west on relatively tame terrain until you approach the town of Mt. Horeb. Approaching mile 30, you’ll be faced with about a 1⁄2 mile long climb that veers to the left then right, where you’ll be greeted by aid station volunteers. Get what you need, then prepare for five miles of work. Miles 30 to 35 (and 70 to 75 on the return trip) take riders through relentless up-down riding that I like to call The Rollercoasters of Witte Road and Garfoot Road. 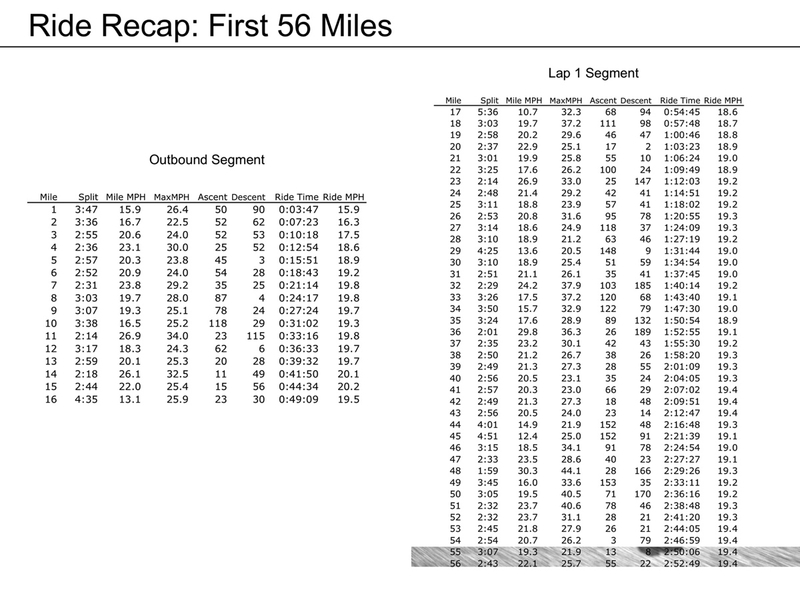 Passing between and through farms, these miles toss it all at you: fast declines followed immediately by sharp uphills again and again, with short stretches of reasonably flat road connecting the little challenges. At first, it’s fun. Then getting over the next hill gets tougher each time. You’ll think you’re done, then there’s more. You’ll see when you get there. You don’t want to be bonking the second time you ride this section. It’s a bad place to be on the rocks. Next up is a slightly dangerous fast, swerving downhill on northern Garfoot Road. You’ll wish you can take it at full-speed, but only the most expert of riders can do it. It’s too easy to lose control on the sharp turns here. Sacrifice a few seconds for better control. The course flattens out on the top half, east-bound road for a few miles, allowing you to relax a little. You’ll need the break, because when you make a right turn at Country Road KP to begin a southward path toward the start of loop two, the course’s most challenging climbs await. The climbs – at Old Sauk Pass and on Timber Lane – aren’t very long, but they can be quite taxing. When you arrive there, settle into your easiest gear, sit back, and pedal as efficiently as you can. Stay steady for the next few miles until you reach the town of Verona, where you'll be greeted by a cheering crowd that treats you as if you are a Tour de France rider. Savor the moments, smile at spectators and enjoy your short time there. 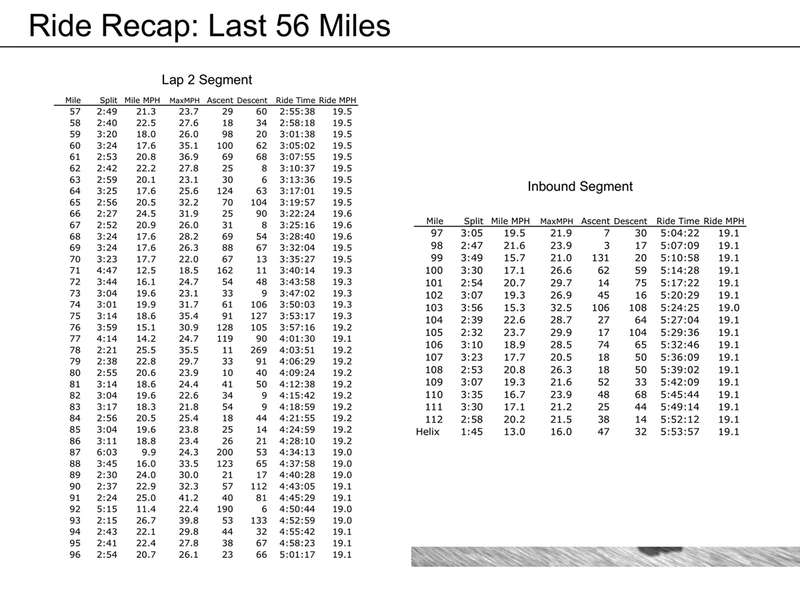 Because after it's over, you are heading back to lap 2. 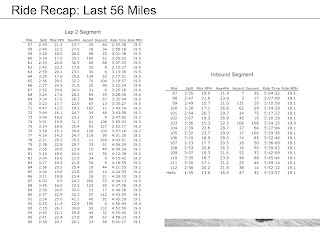 You'll finish lap 2 at about 95 miles, with 17 more to go. Depending on the heat, wind and your nutrition and hydration at that point, those last miles may be relatively breezy or can be very challenging. Don't let the apparent downhill back to town on the race website course map fool you. It's more work that you'll expect. Be prepared mentally and physically at that point, and you'll do fine. The 26.2 Ironman Wisconsin marathon course is entirely self-contained in Madison's downtown and college campus area. You will run two 13.1 laps, starting at Monona Terrace and immediately passing the State Capitol building. You'll descend past the capital on State Street before heading southwest on side streets approaching the Camp Randall football stadium. One of the small treats of this marathon course is running around the field on both laps; a unique experience. Exiting the stadium, you'll then head north and west toward Lake Mendota, toward some welcome cool air and shade of the Temin bike path along Lake Mendota, heading east at first. You'll step off the path onto Observatory Drive, which brings you to the toughest climbs on the run course. My advice to most runners: unless you're gunning for a Kona slot and can't afford to sacrifice anything, walk up these hills. You'll lose a few seconds by powerwalking, but your legs will be most happy for the break. After flying, sort of, down the other side of Observatory Hill, you'll enter the Party Zone of the run course, on State Street. You'll encounter the most spectators on the run course here, and they provide smiles and encouragement. Smile and nod in appreciation, if you can. Get to the turnaround, and your name and hometown will likely be announced to everyone there. After the fun on State Street, you'll return to the westbound Temin Bike path. It's the longest uninterrupted stretch on the run course, and you won't be faulted for thinking the turnaround will never come. 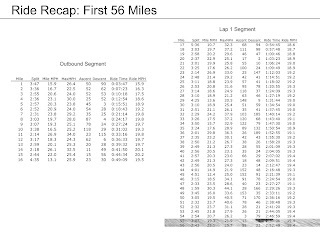 Stay with it, make sure to hydrate well at the several aid stations on this section, and keep moving forward. The good news is that after the turnaround, it's not a long return trip to town, maybe four miles. On the way back, you'll head southeast toward Camp Randall then retrace your steps from there to the State Capitol. The finish line will be just meters in front of you as you make the turnaround to begin lap 2. It's not a fun moment for anyone, but just tell yourself as you head back onto the run course you're getting closer to the finish with every step. After experiencing the first lap, you'll see there are no dramatic tests on the run course, and you'll be able to focus on moving steady and on getting the hydration and nutrition you need. As the miles slowly pass, begin to think about your finish, and soon you'll be there. It's a kick to approach the State Capitol in the final few hundred meters, knowing that the finish line is just beyond it. And in a nice, but too-late gesture, the finish area is on a downhill slope. Though you'll be tempted, don't use the force of gravity to sprint through the finish line. Take it slow and easy, and soak in those last few moments. You deserve it. So do the others around you. Don't blast past the guy in front of you and ruin his finish experience and finisher photo. Be polite and let everyone experience the finish they've been envisioning for months. You've been envisioning it, too. You'll get there, and you will be declared an Ironman. Congratulations in advance. 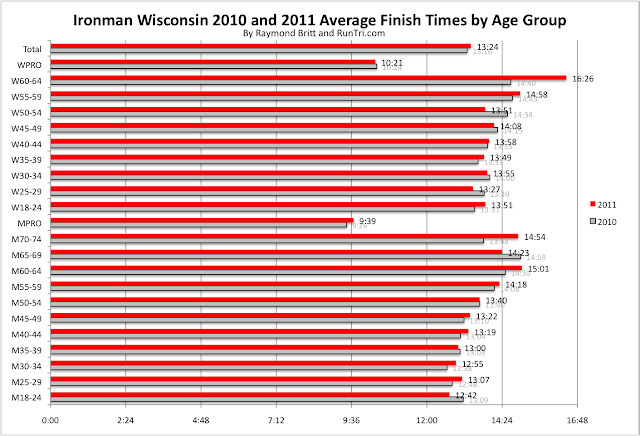 Congratulations to Ben Hoffman and Elizabeth Lyles, Ironman Wisconsin 2012 Champions. 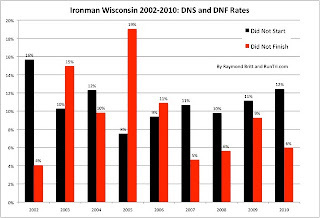 Wisconsin is a tough but fair Ironman course; the average finish time of the 2,343 finishers was 13 hours, 14 minutes, ranking it among the more difficult Ironman events in the world. 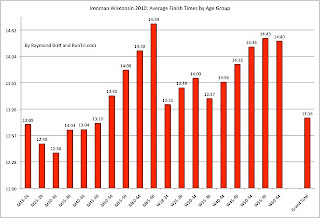 See our Ironman Wisconsin 2012 Results Analysis for average finish times by age group from 2009 to 2012, average splits by age group in 2012, and more. In addition, we shot photos on the course, capturing the spirit of Madison's great event, from start to finish. See them here: RunTri's Ironman Wisconsin 2012 Photos. 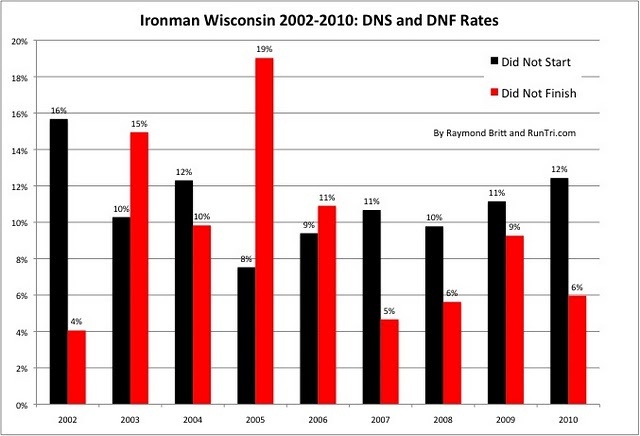 And further below in this post you'll find advice, analysis, as well as a thorough overview of the complete Ironman Wisconsin. 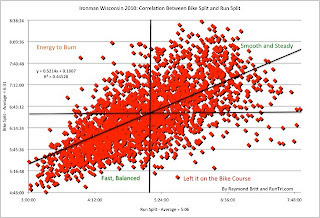 Also see last year's complete coverage: 2011 Race Results Analysis, Kona Qualifying Times Analysis and Ironman Wisconsin 2011 photos pages.